Selling Rhodium Bullion coins to Kitco is easy as we post live rhodium prices for investors to sell their rhodium products to us around the clock. Rhodium coins of respectable provenance have been null in the bullion market. The renowned British bullion manufacturer, Baird & Co., changed that situation with these new and first Rhodium coins in the industry. Minted in the United Kingdom from .999 fine rhodium, these coins make the rarest precious metal available to you in a familiar format. Made with a hint of English pride, they conform to the very highest standards of quality. Why sell Rhodium Coins to Kitco? Kitco is the trusted leader in the rhodium and physical precious metals industry. 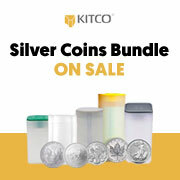 Rhodium bullion and other precious metals sold by Kitco are recognized in bullion markets around the world. With our focus on rhodium coins, bars and rhodium bullion, you benefit from our low rhodium prices and premiums that are highly competitive in the rhodium bullion industry.